It’s definitely having a bit of a moment in the limelight and it’s my recommended choice for a perfect Christmas gift this year. Boutique, loose leaf brews with the fancy combinations are catching my eyes everywhere and supermarket tea isles have suddenly expanded packing in new brands, more varieties and prettier boxes than ever before. Even traditional brands such as Twinnings seem to have upped their game. Amanzi Tea has just opened in central London (just off Marylebone High Street) offering an impressively large variety of teas for all tastes. 40 blends to be precise. It’s like the Harrods for tea I guess. I’m due a visit soon so will be back with more info on that. Also check out Camellia’s Tea House on Kingly Court in Soho, which I recently discovered (thank you Mark Smith), which serves traditional afternoon teas in a quaint setting. 1. Tick Tock Rooibos Honey, Lemon and Ginger – a new brew for winter with a warming combination. If you like a kick of ginger this doesn’t fall short and the honey and rooibos give it a mellow edge. It’s gone down a storm in the BeautyMART office and I just about caught the last tea bag today – the rapidly empty box said it all. £1.99 at ticktocktea.com. Eco credentials? 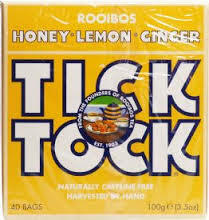 Tick Tock supports the British Bee Keeper’s Association for bee health research; no GM crops, no additives and no chlorine-bleached tea bags; they also trade fairly and work with South African Rooibos Council to protect region’s agriculture. 2. Neal’s Yard Remedies New Organic Teas – a new collection of organic teas coming in eight varieties. The Vitality is my favourite with Siberian Ginseng, thyme and liquorice for a unique and uplifting brew. Eco credentials? 100% organic and Soil Association certified. I discovered Camellia’s Beautiful Skin Tea on a visit to Nirvana Spa in Reading with Germaine de Cappucini and bought a box as I was instantly impressed by the interesting combination (dandelion and chickweed) and the way it was wrapped up in natural cloth and hand tied. Too cute. Eco credentials: Can’t find any info on the website about where the tea is sourced etc but there is some mention of things being handmade in small batches. Last but certainly not least it’s Choi Time – a Chinese heritage tea brand, whose founder Melissa Choi is seriously passionate about the benefits of green tea and rose tea in particular. I discovered Choi Time several years ago and was luckily reintroduced to it recently. The jasmine flower teas which open up as they brew make a visually impressive brew and all the teas are packaged in gorgeous boxes so they make excellent gifts as they are. Another thing to check out is the Tea Flask, which Choi Time kindly sent me recently and I absolutely love, it’s a staple in my day. This 750ml flask has a compartment for lose tea leaves at the top and a built-in diffuser so you just top it up with hot water throughout the day and tip it upside down to brew. It’s the most convenient way of drinking lots of green tea, great for keeping skin glowing. 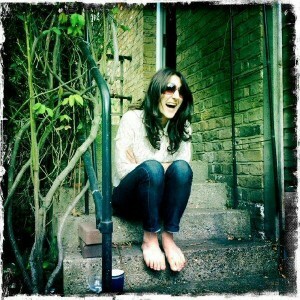 Eco credentials: Sourced personally by Melissa and directly from growers in China, who are connected to her family there. No conglomerates, no unfair trading. So there we have it – tea is my recommended choice for alternative Christmas giving this year. It has an every day use, it’s good for you, delicious and is not a gift that will clog up your loved one’s life with unnecessary stuff! I was just browsing through some of your older posts and saw this. I love tea so thought this was great! I am going to go read some more now.